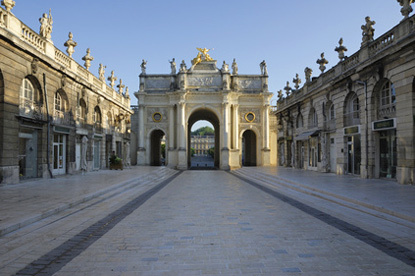 Ducal Palace & Craffe Gate, Nancy. Nancy (Nanciacum in Medieval Latin, Nanzig in archaic German, Nanzeg in Luxembourgish; pop. 110,000, with suburbs 420,000) is the capital of the Meurthe-et-Moselle Department, the historical capital of the Duchy of Lorraine, and the largest urban area in the Lorraine region. It is also the second largest city in Eastern France, and the 5th largest university town nationwide in terms of student population. 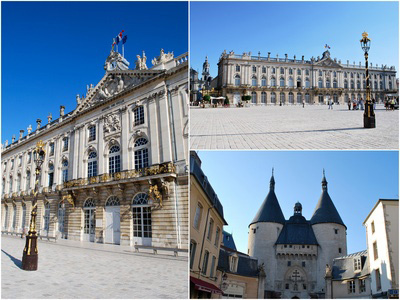 Three squares in Nancy, Place Stanislas, Place de la Carrière, and Place d'Alliance were added on the UNESCO World Heritage Sites list in 1983. 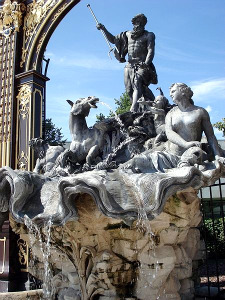 The region of Nancy was settled as early as 800 BCE, thanks to the easily mined iron ore in the Meurthe River. No major settlement existed in ancient times though. The first small fortified town was built by Duke Gerard of Lorraine around 1050, and named Nanciacum (Nancy). In 1218, Nancy was burnt to the grounds by Emperor Frederick II in the War of Succession of Champagne. The city was rebuilt, enlarged, and endowed with a new castle. In 1477, Charles the Bold, Duke of Burgundy, was defeated and killed in the Battle of Nancy, opposing him to Duke Renald (René) II of Lorraine. Renald II also built the first ducal palace, as well as several churches. The city expands and becomes a major cultural centre under Dukes Charles III (1543-1608) and Leopold I (1679-1729). Duke Francis III of Lorraine (1708-1765), born in Nancy, would become Holy Roman Emperor Francis I. By his marriage to Maria-Theresa of Habsburg (1717-1780), Queen of Bohemia and Hungary and sovereign Archduchess of Austria, Francis would found the line of Habsburg-Lorraine, which would give three more Holy Roman Emperors (until the last one in 1806), four Austro-Hungarian Emperors (until the last one in 1918), the sole Emperor of Mexico, and several sovereign Italian Dukes (Tuscany, Modena, Parma). Stanislas Leszczynski (1677-1766), forced to abdicate the throne of the Polish-Lithuanian Commonwealth in 1734, receives the Duchy of Lorraine from his son-in-law Louis XV of France in 1737. The agreement was that upon his death the duchy would be incorporated to the Kingdom of France. Stanislas ruled as an enlightened monarch, and creates the magnificent Place Stanislas, now on the UNESCO World Heritage List. In 1778, the bishopric of Toul is moved to Nancy. During the French Revolution, as unrest surfaced within the French armed forces, a full-scale mutiny took place in Nancy in the summer 1790. A few reliable units lay siege to the town and shot or imprisoned the mutineers. After the Franco-Prussian War (1870-1), Nancy remains French while Metz and the Alsace are ceded to Imperial Germany. Numerous people from the annexed territory refused the German nationality and moved to Nancy, among whom many intellectuals and industrials. At the turn of the 20th century, it is from Nancy that starts the French Art Nouveau movement. The School of Nancy counts such artists as Émile Gallé, Antonin Daum, Louis Majorelle, Victor Prouvé or Eugène Vallin. Amongst the most famous people born in Nancy, let's cite Edmond de Goncourt (1822-1896), the founder of the literary Académie Goncourt; the mathematician Henri Poincaré (1854-1912); the biologist François Jacob (born in 1920), Nobel Prize in Medicine in 1965. 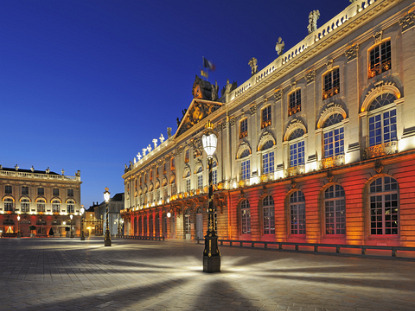 Nancy can be divided in several neighbourhoods, each belonging to a different historical period. The Old Town (Ville-Vieille) dates from the 12th to the 16th century and is located in the northern half of the city centre. The southern half is the New Town (Ville-Neuve), built by Duke Charles III in the 17th century. The two parts are separated by Stanislas Square (Place Stanislas) and Rue Sainte Catherine. West of the centre, the Quartier Saint-Léon was built at the turn of the 19th and 20th centuries, and possess quite a few Art Nouveau buildings from the Nancy School, such as the Villa Majorelle, the Chamber of Commerce and Industry, or the BNP building. The main town square of Nancy was named after Stanislas Leszczynski (see History above), who commanded the works. The perfectly harmonious square was designed in the neoclassical style by the court architect Emmanuel Héré de Corny (1705-1763), and constructed between 1751 and 1760. The square, now fully pedestrianasied, separates the old medieval town from the newer 17th-century town. It was originally called "Royal Square" (Place Royale) and had a statue of Louis XV standing in the middle, which was removed during the French Revolution. The square was renamed Place du Peuple, then Place Napoléon, before acquiring its present name in 1831. Measuring 125 meters in length on 106 meters in width, Stanislas Square is entirely paved with light stones interlaced with darker ones forming a cross design. The magnificent gilded iron gates are the work of Jean Lamour. Stanislas Square is surrounded by 7 pavilions. 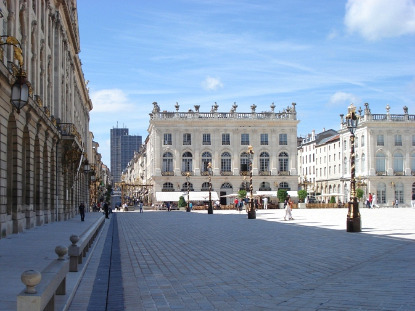 The largest of them (southern side) houses the City Hall of Nancy (Hôtel de Ville), which has a few noteworthy living rooms (the Salon Carré, the Grand Salon, and the Salon de l'Impératrice). The other pavilions are occupied by the Préfecture of Meurthe-et-Moselle in south-east corner, the Opéra-Theâtre (the former Episcopal Palace) and the Grand Hôtel (originally the Hôtel de la Reine) on the eastern side, as well as the Fine Arts Museum (Musée des Beaux Arts, originally the Collège de Médecine) and the Pavillon Jacquet on the western side. The northern side was constructed lower for defensive purposes. In front of the City Hall, take Rue Héré to reach the Triumphal Arch (Porte Héré), built between 1754 and 1756 in the honour of Louis XV. On the other side of the arch is the long Place de la Carrière, with its two superb fountains, its double tree-lined avenue, and its symmetrical buildings facing each other down its length. At the northern extremity of Place de la Carrière stands the Government Palace (Palais du Gouvernement), the old residence of the governors of Lorraine. The entrance to the Parc Zoo de la Pépinière is on the right when facing the palace. It comprises an English-style park, a rose garden, and a small zoological garden. Standing at the corner of Place de la Carrière and the Grande Rue (the main axis of the old town), the Ducal Palace (Palais Ducal) dates back the 13th century. Renald II rebuilt it in a mixture of Flamboyant Gothic and Renaissance styles from 1502. The construction continued under his son, Anthony, who added notably the Porterie and the Galerie des Cerfs. Most of the palace was dismantled by Duke Leopold, who intended to replace it by a bigger one that could rival with the Louvre. However, this project was never completed due to financial problems. Duke Stanislas used the foundations of this new palace to build the Palais du Gouvernement and its gardens. The Ducal Palace now houses the Historical Museum of Lorraine (Musée Historique Lorrain), an extraordinary museum covering the whole local history from the prehistory. Exhibits range from the Celtic, Gallo-Roman and Frankish periods to medieval religious art, to military equipment, to folkloric costumes, as well as fine arts or musical instruments. Next to the palace stands the 15th-century Église des Cordeliers, with its single nave. Of interest are the tomb of Renald II, and especially the recumbent effigy of his wife Philippa of Guelders. The adjoining Ducal Chapel (built from 1607) is the burial place of almost all the dukes of Lorraine. The older tombs were moved from Saint-Georges Collegiate Church (destroyed 300 years ago), where they were previously interred. The convent of the ducal chapel houses the small Museum of Popular Arts and Traditions. Not far from the Ducal Palace, the Neo-Gothic Saint-Epvre Basilica is one of the newest churches in Nancy, despite its impressive size. Its construction was financed by donations from Poland and Austria. One of the most important remains of the medieval fortifications is the 14th-century Craffe Gate (Porte de la Craffe), the main city gate in the north of the medieval town. 100 metres further north is the 16th-century Citadel Gate (Porte de la Citadelle). A few townhouses require a special mention in the old town, such as the Renaissance-style Hôtel d'Haussonville (9, Rue Trouillet), the Hôtel de Lillebonne (12, Rue de la Source), as well as the 18th-century Hôtel de Fontenoy (6, Rue Haut-Bourgeois) and Hôtel Ferrari (29, Rue Haut-Bourgeois). Also note the Art Nouveau Maison Weissenburger at 1, Boulevard Charles (just east of Citadel Gate). One hundred metres east of Stanislas Square, Alliance Square (Place d'Alliance) was originally built in homage to Stanislas Leszczynski. Its name commemorates the alliance between France and Austria signed on 1 May 1756, and marked by the marriage of the future King Louis XVI with Marie-Antoinette of Habsburg. 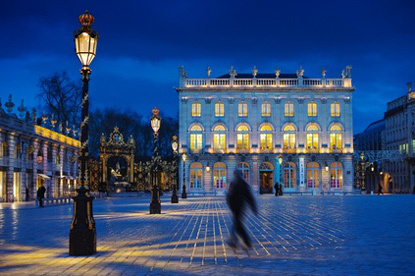 Like Stanislas Square, it was designed by Héré. 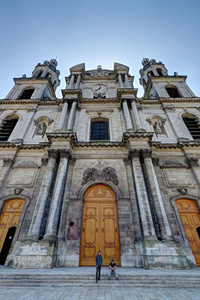 South of Alliance Square, the Nancy Cathedral (Cathédrale Notre-Dame-de-l'Annonciation de Nancy) was consecrated as the new seat of the diocese of Nancy-Toul in 1778. It is one of the few neoclassical cathedrals in France. On Rue Sainte Catherine, Nancy's Museum of Zoology is composed of a tropical aquarium on the ground floor, and a natural history museum on the first floor. The Museum of the Nancy School is dedicated to the Art Nouveau movement that flourished in the city between 1885 and 1914. Obviously housed in a Art Nouveau residence, displays include furniture, glass works, posters and drawings, wall paintings, and ceramics. The museum is located about 1 km south-west of the main train station, at 36-38, Rue du Sergent Blandan. The oldest building in Nancy is the 12th-century Tour de la Commanderie Saint-Jean-du-Vieil-Aître. It owes its name to the commandery of the Knights Hospitaller, who erected a tower near the old Merovingian "Aître" cemetery. 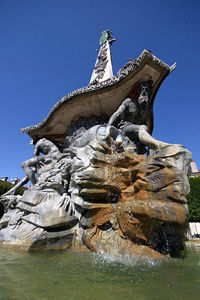 It is located outside the city centre, some 400m west of the train station, on Impasse Clérin, at the end of Avenue Foch. Among other notable churches in town, let's note the 18th-century Église Notre-Dame-de-Bonsecours (where Stanislas Leszczynski is inhumed), the Baroque-style Église Saint-Sébastien, or the Église Saint-Nicolas. Nancy also has a Protestant temple and a synagogue. Nancy is 55km south of Metz on the E21/E23 motorway. This motorway splits in Nancy, with the E21 leading toward Toul (20km), Vittel (90km) and Dijon (150km), and the E23 going to Epinal (40km) and Besançon (210km). Paris is over 300km away, but with the N4 linking both cities in a straight line. Trains between Metz and Nancy take 30 min to 1 hour, depending on the type. The TGV links Paris to Nancy in 1h30min. There are also regular trains to Strasbourg (1h20min) Luxembourg (1h30min), and Dijon (2h20min). The train station is located about 500m west of Place Stanislas.